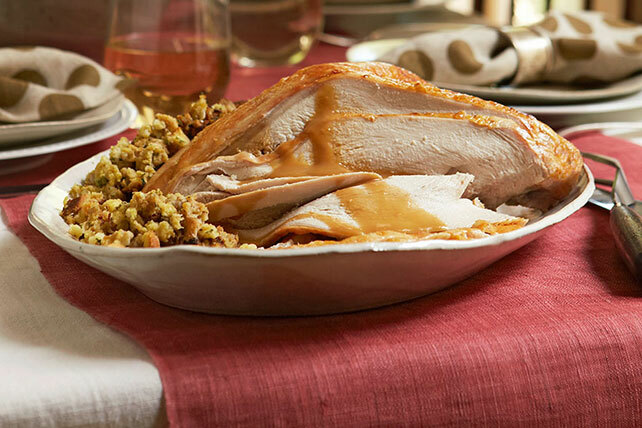 Try this Turkey Breast with Stuffing and Gravy recipe for Thanksgiving. Requiring only 20 minutes of prep time, this easy-to-make Turkey Breast with Stuffing and Gravy recipe is ready to serve in no time! Prepare stuffing as directed on package; mound in center of 13x9-inch pan sprayed with cooking spray. Place turkey, breast side up, on top of stuffing, covering stuffing completely. Brush turkey with oil. Bake 30 min. Reduce oven temperature to 325ºF. Bake turkey an additional 45 min. to 1 hour or until turkey is done (165ºF). Let stand 10 min. before carving. Meanwhile, heat gravy in small saucepan; stir in sour cream. Serve turkey and stuffing topped with gravy. Prepare turkey as directed but do not bake with stuffing. Prepare stuffing as directed on package during the turkey standing time. Serve with turkey and gravy as directed. Because of the variations in sizes and shapes, the easiest way to ensure that the turkey and stuffing are done is to check the temperatures - both should have an internal temperature of 165ºF. Simply insert the thermometer into the center of the stuffing or thickest part of the turkey breast, avoiding any bones. Prepare using STOVE TOP Cornbread Stuffing or STOVE TOP Stuffing Mix for Turkey.